This is one of the 108 Divya Desams of Lord Vishnu. According to scriptures, Lord granted darshan to sage Brugu from under the Kanaka Vimana facing east. Saint Peyazhwar in his hymns praises this shrine equal to that of Lord Uppiliappan and temples of Kumbakonam and Tirupathi. Vaishnava Acharya Sri Mahadesikan had praised Perumal in his celebrated Kamasikashtakam. It is believed that chanting this sloka daily will bring in tallest benefits of the blessings of Lord Narasimha. The shrine is also known as Kamashika Narasimha Sannadhi. Of the Avatars-incarnations of Lord Vishnu, Sri Narasimha Avatara is considered great representing His “Protection Readiness” for His devotees. In this Avatar He came to the rescue of His devotee instantly from a pillar. After destroying Hiranya, Lord wanted peace. Tamil word Vell means desire. 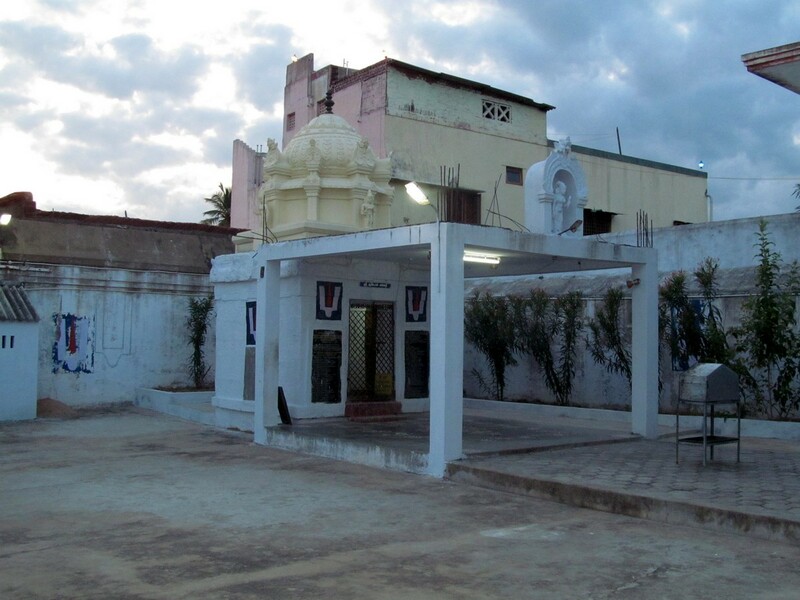 Perumal had the desire to be calm and peaceful in this place, it came to be known as Velirukkai which later changed as Velukkai. A group of demons came to destroy a yajna proposed by Lord Brahmma. He surrendered to Lord Perumal for protection. As Perumal appeared from a pillar to protect Prahladha in lion-human form (Narasimha), He came now in the same form from Hasthisailam cave and drove the demons. They disappeared from this place in Kancheepuram. 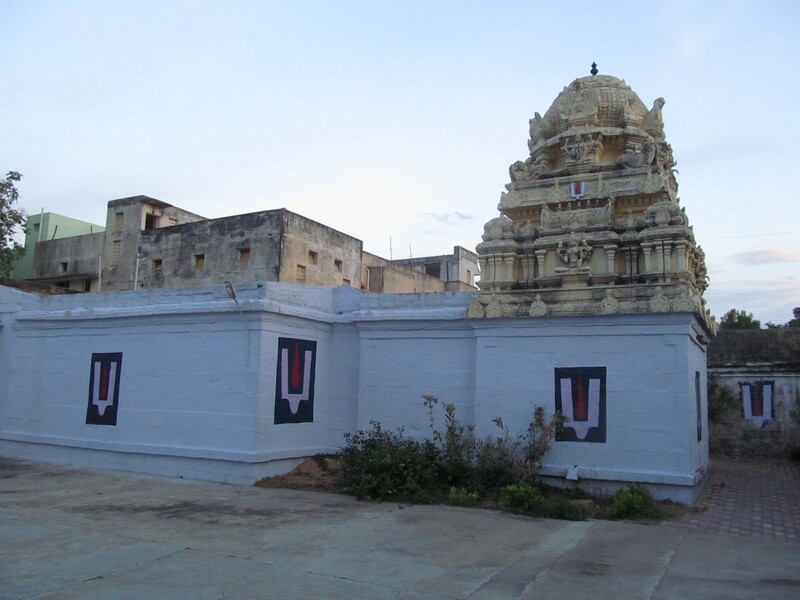 Lord stayed there as Yoga Narasimma facing east. Lord is known as Aall, Hari and Mukunda Nayakan. 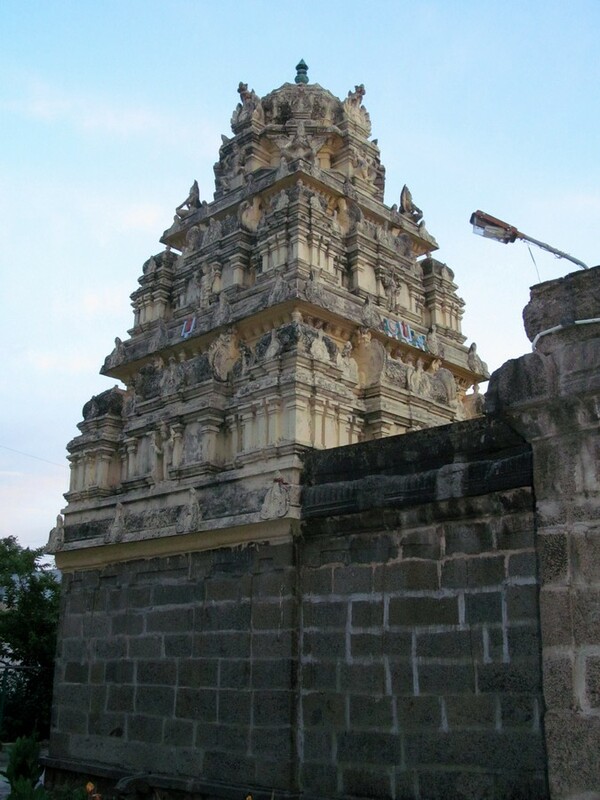 The Vimana above the sanctum sanctorum of Lord Narasimha is called Kanaka Vimanam. 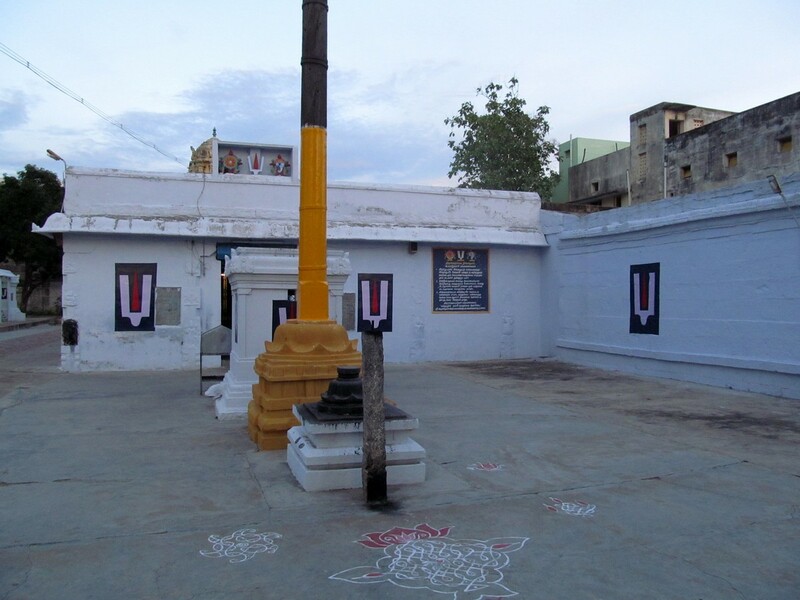 Sage Brugu had worshipped Perumal in this temple. Sri Sudarsana Chakkarathazhwar the deity of Lord Vishnu’s discuss graces from a shrine in the outer corridor-prakara. Sri Garuda Bhagwan in the Narasimha shrine appears with his head slightly on a side as if unable to bear the fury of the Lord. This is a strange and different style of Garuda in this temple. 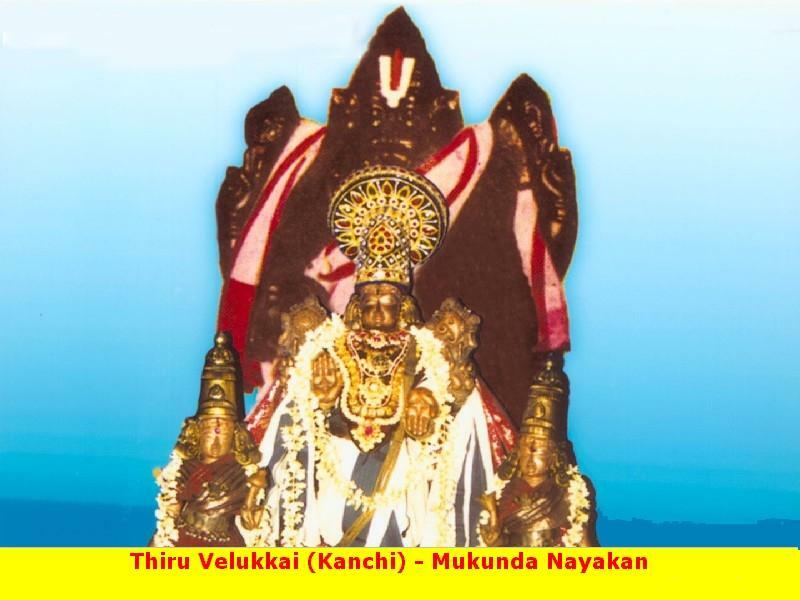 Festival: Vaikunda Ekadasi is devotionally celebrated in the temple in December-January. 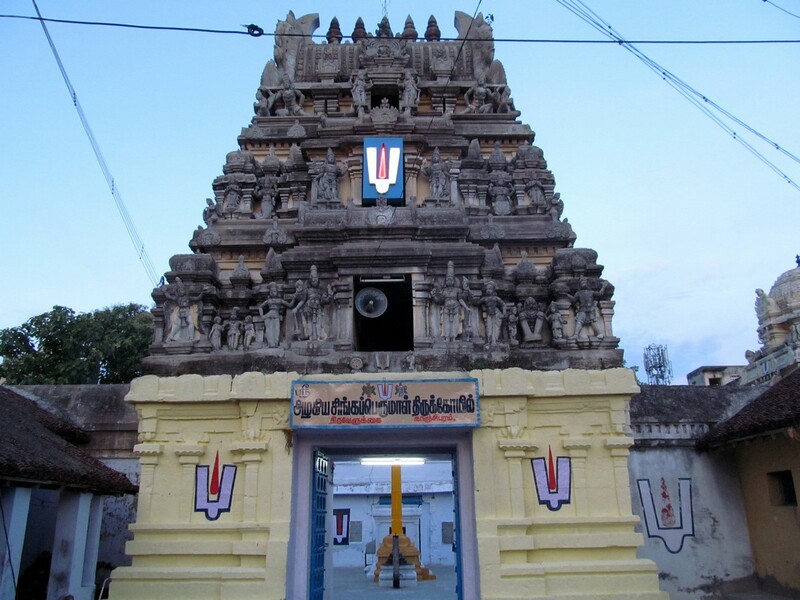 The temple is open from 07:00 a.m. to 11:00 a.m. and from 05:00 p.m. to 07:30 p.m.
On the way to Varadaraja perumal temple from the Kanchipuram bus stand, take the right just before Asthabujagarm temple towards Vilakoli perumal street. After a few metres, take the left to reach this temple.